In order to achieve a Lifetime Breeding License the stallion must fulfill the following Performance Test Requirements which means that each stallion must pass / complete either the 100 Day Test (or 70 Day Test + 30 Day Test), the Advanced Stallion Test or the Sport Test. The history of the 100 Day Test reaches far back into the early 19th century, when the sport horse breeding industry established its initial test specifically for stallions. It all began in 1822 with special races to test imported English thoroughbred stallions. By 1830, those breeding areas that used thoroughbred-cross stallions would regularly test those stallions at specially-held races. Until the early years of the 20th century, only these special races were used to test the thoroughbred-cross stallions, but later in the century the idea of a more complex testing was developed by including the adaptation of other testing elements such as the pulling test, established from 1905 on for stallions in Westphalia. The exigencies of World War I demanded a large number of horses for military use, and sheer numbers overruled quality in breeding at that time. Finally, in 1926, the first formal testing facility for stallions was established for Trakehner breeding in East Prussia. Here, as well as from 1928 on at the state stud of Celle in Hanover all 3-year-old stallions were tested over nearly a year-long period. The basic criteria in these early testings, such as temperament, willingness to work, and quality of movement, were similar to those we have today, while some special criteria, i. e. the pulling contest, have been altered over time. In 1974 laws governing German breeding established the mandatory stallion testing over the minimum period of 100 days. In North America, the ISR/Oldenburg Registry established the first 100-Day Test in 1986, and has organized a test every other year since. In 1987, the American Hanoverian Society had its first testing at November Hill Farm. From 1988 on, the ISR/Oldenburg N.A. test was held at Rancho Murieta Equestrian Center near Sacramento, California. This series was interrupted when the fifth test was held at the Kentucky Horse Park in Lexington in 1994. November Hill Farm held its last test in 1995, and therefore, since 1996 the ISR/Oldenburg Registry was forced to alternate test locations between the West- and East Coast. From 1998 on the testing had been jointly organized by the AHS and ISR/OLD NA at Paxton Farm, Batavia, OH. Many test criteria have changed over the past thirty years, as they have been adjusted to the state of the art needs of contemporary sport horse breeding. For the ISR/Oldenburg N.A. 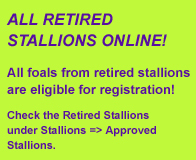 as well as for other major registries this testing, (or similar performance requirements) is the mandatory second step for those stallions seeking a lifetime breeding license. From 2009 on the ISR-Oldenburg N.A. offers a 10 day Advanced Test. The 100 Day Test or 70 Day Test is of course still accepted for the Lifetime Breeding License. In order to get its ISR-OLDENBURG N.A. Lifetime Breeding License a stallion must finish the 100-Day Testing with at least 80 points. To compute the results the scores of all criteria will be taken into consideration and multiplied with certain factors. Theoretically each stallion starts with 100 points at the beginning of the testing. On each of its individual scores the stallion then gets plus or minus points, depending on the certain standard the testing is based on. The computer program takes also into consideration the results of the previous testing prior to the current testing to compute a proper standard deviation. The final test is performed before a commission of independently judging experts. Evaluation of jumping aptitude under saddle over a set course of obstacles (3'4" to 3'8") by two experts. The score for the stallion in this section is the total of the two individual scores divided by two. Two independently judging experts give two marks each, one for the stallions' technique and one for its capability in free jumping. The score for the stallion in this section is the total of the two times two scores divided by four. The stallions will be ridden in succession by three experts whose evaluation of their rideability will be made independently according to the requirements of at least a training level dressage test for which appropriate scores will be given. The score for each stallion in this section is the total of its scores given by each expert divided by three. In addition all stallions will be shown under saddle in basic dressage. The score for each stallion in each individual pace is the total of the individual scores divided by three. All riders are given the same riding instructions and are admonished to check their time. Time is taken merely for evaluation purposes so as to ensure that all stallions are stressed as equitably as possible.At least three independently judging experts evaluate the manner of galloping during the course and the stallion's jumping technique. The score for each stallion is the total of all individual scores divided by three or four. Immediately following the crosscountry ride, the stallions are to be galloped at top speed over a distance of 1000 m. The time will be taken for statistical reasons only. will check pulse and respiration rate as well as the recovery time after the hunting gallop. The veterinarian will determine, if a stallion has considerable deficiencies in his circulatory system and/or cardiac disfunction. The final index will be computed under consideration of the testing results of the two prior US testings. Four-year-old and older stallions will be given an age handicap of 5 point deduction. The test result for each individual stallion is final and - except for possible errors in computation - cannot be changed. Upon completion of the test, the results of each stallion will be given to the owner and published. 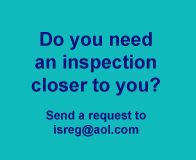 All stallions are or had been approved by ISR/Oldenburg NA. Please be aware that the results of the different testing years are not comparable, because the deviation depends on the average quality of the respective group of stallions. Starting 2009 the Registry offered the new Advanced Stallion Performance Test (10 Days). All results are listed in the Member section.